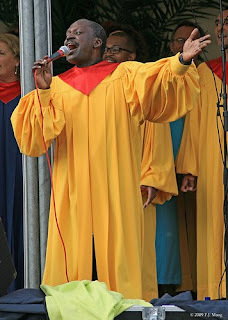 Was with the Friendship gospel choir at an open air concert, and sang some of the solos and man what a concert. I hate to use the word show, as that is of course the technical term, but christians have this not well hidden ‘agenda’ to reach the world for Jesus . Why not? Some one said once, if you don’t stand for anything, you gonna fall for anything. I stand for God and for his glory in a world that’s going haywire at times. It was beautiful to see the market crowd in Doetinchem, the Netherlands where we sung really enjoying the concert. Two touching incidents to me. A gentleman on an electronic wheelchair. He knew that he could not stand up and dance like the rest of us, bar Jesus saying ‘Stand up and walk…’ He turned his wheelchair to a dancing machine and twirled it around so beautifully and skillfully. Secondly, There were these little kids who sat raptuously watching, clapping all the way. One of the mums had to go and pickup up her child, who was kick and screaming and just did not want to leave. Aaw..